Your Express Checkout integration must conform to PayPal&apos;s user interface requirements. To inform buyers that PayPal is accepted on your website, you must place PayPal button and logo images in your website checkout flow. PayPal requires that you use PayPal checkout buttons and PayPal mark images hosted on secure PayPal servers. When PayPal updates an image, the changes appear automatically on your website. Do not host copies of the PayPal images locally on your servers because outdated PayPal buttons and images reduce buyer confidence in your web site. To implement Express Checkout, offer it both as a checkout option on your shopping cart page and as a payment method on your payment options page. On your payment methods page, add the PayPal mark as one of the payment options, and set PayPal as the default option. In this flow, buyers initiate the Express Checkout flow from your payment methods page. When the buyer chooses to pay with PayPal, the Express Checkout flow commences. The buyer logs in to PayPal and selects the funding sources for the transaction and a shipping address. The buyer is then returned to your site to confirm the payment. This flow saves the buyer the manual effort required to enter payment details with each purchase. However, by also placing a PayPal checkout button earlier in the checkout flow, on your shopping cart checkout page, you can save the buyer more time. See Starting the PayPal flow from your cart checkout page. Place the PayPal checkout button on your shopping cart page. To create Express Checkout buttons, see the Express Checkout Integration Guide. Add a PayPal checkout button on your shopping cart page. A buyer clicks the button to initiate the Express Checkout flow. This payment flow is faster than the previous flow because buyers skip the pages on your website that gather shipping and payment details. Instead, the buyer is redirected to PayPal from the shopping cart page. There is no need to collect the buyer&apos;s shipping information; PayPal can supply you with the buyer&apos;s shipping information, so there is no need to collect it. The flow starts when a buyer on the cart checkout page wants to check out using PayPal. By clicking the PayPal checkout button, the buyer is immediately redirected to the PayPal site. After logging in and reviewing the order, the buyer is returned to your site for final confirmation of the purchase and optional account creation. 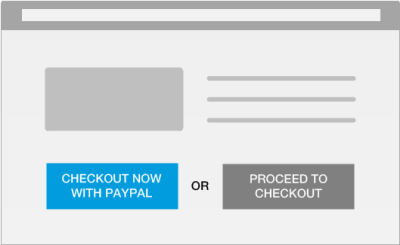 With the PayPal mark flow, buyers pay you via PayPal&apos;s secure site at the end of your checkout flow. By placing a checkout button earlier in your checkout flow, you eliminate the need for buyers to enter their shipping and billing information. This integration allows the buyer to complete a purchase without manually entering additional data, since the shipping address (not by default), email and telephone contact details are supplied by PayPal. The buyer only needs to review the information and confirm the purchase. By simplifying the checkout experience you can help to increase your conversion both online and on mobile. Optionally, you can ask the buyer to create an account on your website without entering any additional data other than a password.